Dhaka Eastern College Job Circular 2017 has been published in daily newspaper also to get from BD Jobs Careers. Dhaka Eastern College is a Top Educational Private Organization in Bangladesh. Recently Dhaka Eastern College looking various position new job holder. The job title Name: Lecturer, English Teacher, Mathematics Teacher, Carukaru Teacher. The Job Published Date 08 February 2017 and Application Deadline 24 February 2017. 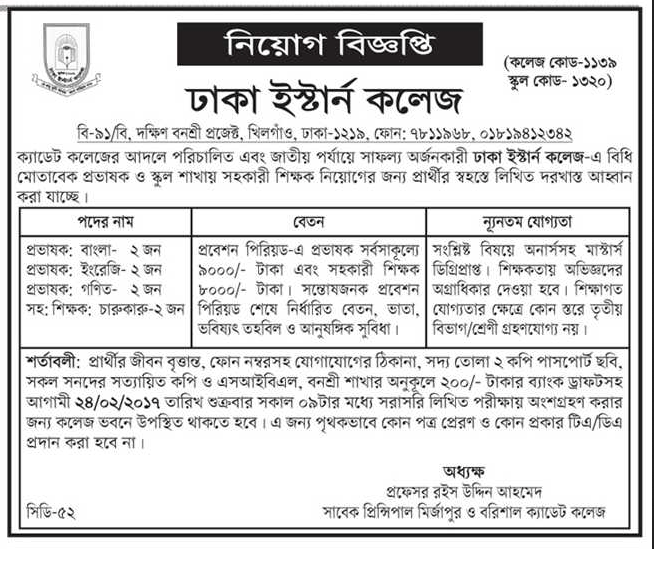 You can check full details in below job circular image. Check out and Apply Now!! This entry was posted in All Jobs, Dhaka Jobs, Education/Training, Epaper Jobs and tagged dhaka eastern college job circular 2017 by admin. Bookmark the permalink.